The pronunciation of the name collected during the first Ordnance Survey, Bin a yoragaun, was not as one would expect from the current anglisation Ben Creggan. John O'Donovan interpreted this as Binn a Chorragain. This suggest that the Ben Creggan represents a slight re-interpretation of the name. Walks: for a route taking in Ben Gorm and Ben Creggan, see Whilde & Simms, New Irish Walk Guide - West and North, 60-61. Ben Creggan is the second highest mountain in the Ben Gorm Mountains area and the 122nd highest in Ireland. Ben Creggan is the most northerly summit in the Ben Gorm Mountains area and also the most westerly. Park at L888 673 A (Point A) in the entrance to a Coillte forest. Cross the road and begin to ascend the long ridge on the eastern side of Ben Creggan. This is a fairly gently rising slope about 3km long, with the going underfoot fairly solid, mostly rocky. Ground becomes markedly steeper at point L864 667 B, and continues in this fashion for the remaining 750m climb, which will take you directly to the well-defined summit, which is marked by a cairn. 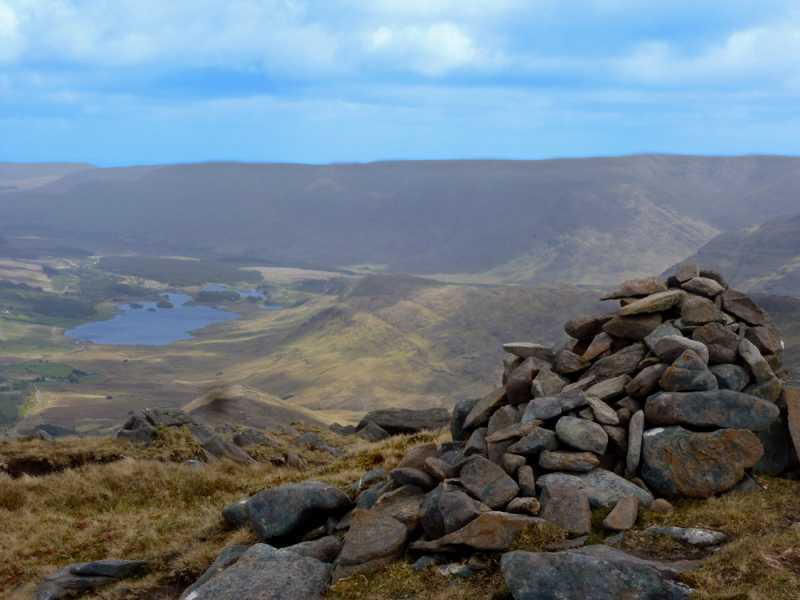 Amazing views of Mweelrea to the west and Tawnyard Lough to the east, although the view of Doo Lough is partially blocked by the bulk of Barrclashcame. Car to summit will take you about an hour and a half.